Because this is the first ever professional women's lacrosse league, when the draft takes place this Wednesday night, there will be more than just top college talent hearing their names announced for the first time. World champions and former stars of the NCAA will find themselves suiting up for brand-new franchises in Boston, Philadelphia, Baltimore, and Long Island. Each new team's roster will have 20 players. Players who registered for the draft online gave their top three preferences of which market they would like to play for, which doesn’t matter terribly since most of the games will be played in tournament formats at neutral sites. If anything, the overall preference might come down to coaching staff and potential teammates. Plenty of coaches would be familiar with the top college talent. Loyola head coach Jen Adams will head the bench for the Baltimore Ride, and the Maryland graduate is sure to attract several current and former Greyhound stars, including current goaltender Molly Wolf. The Boston Storm made Amy Patton, the head coach at Dartmouth, their leader on the sidelines. Patton has coached 25 years with the Ivy League team, and would presumably draw top talent from the conference and local powerhouses, such as Boston College. Nicole Troost and her 42 goals out of UMass could also be a player that the Storm would target. Jaclyn Leto from Patton’s Dartmouth would be another obvious attraction for the team. Shannon Smith, the bench boss of Hofstra, will coach the Long Island Sound. Lindsay Scott, who has 40 goals this season, would be an obvious target for the the Sound. The Philadelphia Force will be led by Penn State head coach Missy Doherty, who led the Nittany Lions to a Big Ten title last season. With so many of the games in Bethlehem, Pennsylvania to start the season, it should be easy for Doherty to bring in local players. Other top players who saw time on the 2015 Federation of International Lacrosse roster and who have already graduated are Alex Aust (Maryland), Danielle Etrasco (Boston University), Liz Hogan (Syracuse), and Alyssa Murray (Syracuse). Several men’s lacrosse leagues have been attempted, but this is the first time that the women will have the opportunity to prove themselves professionally. The first tournament of the year is scheduled for May 28 at the University of Lehigh, where all four teams will be in action. Victory Press will be providing UWLX coverage all season, so check back later this week for a recap and an analysis of Wednesday's draft. 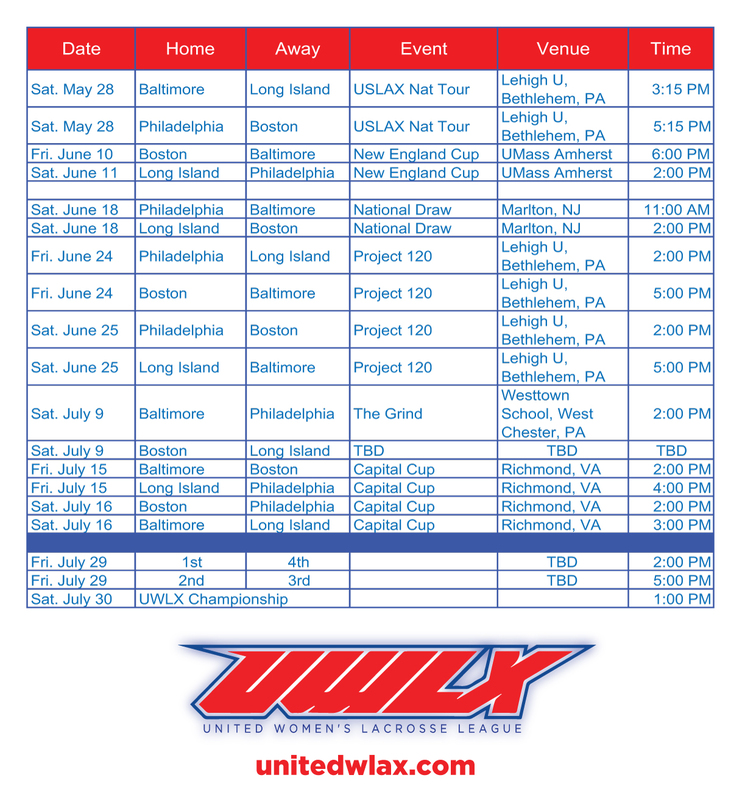 Check out the full schedule of tournaments, via UWLX. Bethlehem, PA; UMass Amherst; Marlton, NJ; West Chester, PA; and Richmond, VA will all host events this summer.